I want to drive there myself. What is the motorable route? I want to opt for public transport. How long is the trek? How is the trek route like? Do I need a guide? Is there any Medical Aid available? Where to stay, eat, and how much will it cost? Is it possible to do Gaurikund-Kedarnath-Gaurikund in one day? Kedarnath (3,553 metres, approximately) is a Hindu temple dedicated to Lord Shiva located in the Rudraprayag district of Uttarakhand. 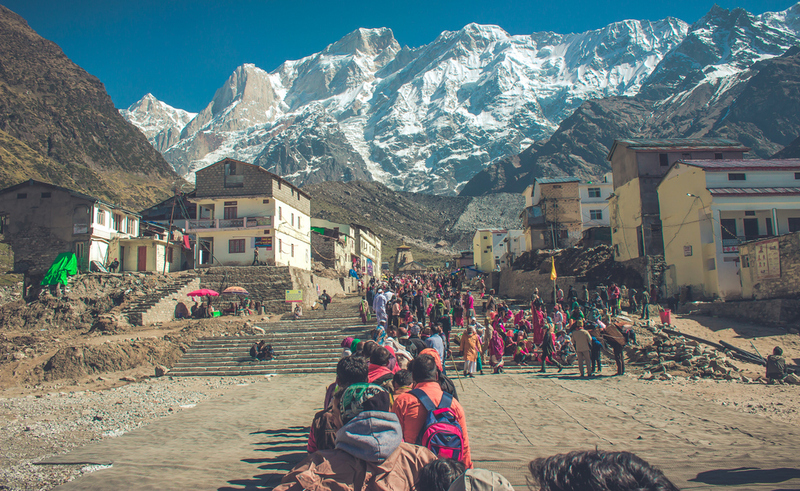 It lies just below the base of the mighty Kedarnath peak (6,940 metres), and is the First Kedar to be visited in case you are staying true to the sequence of the Panch Kedar circuit. The other four being Madhmaheshwar, Tungnath, Rudranath, and Kalpeshwar. The motorable road ends at Gaurikund, but you’ll need to park your vehicle at Sonprayag. No private vehicles or even taxis from outside are allowed to go beyond Sonprayag. The only option is to board one of the shared taxis that specifically run from Sonprayag to Gaurikund. This more than sorts it out in case you are driving here yourself. The road is more or less well-maintained except for a few patches that fall under the landslide zone. Road from Guptkashi to Sonprayag is patchy at best. Buses, both local and of Uttarakhand State Transport, and shared taxis start plying from Haridwar/Rishikesh to Sonprayag as early as 4 am. That being said, you should know that all the local buses take their own sweet time and multiple halts. All the buses and taxis will drop you at Sonprayag. After this, there is no other choice but to board another shared taxi to Gaurikund. It should cost one person 1000-1200 bucks, Haridwar to Haridwar. The last stretch to the Temple. Kedarnath Trek, Uttarakhand. It is a well laid out trek all the way through, paved and pretty straight forward. From Gaurikund to Rambara Bridge (about 7 km) it is gradual yet easy ascent. It is a steep, gradual ascent after crossing the bridge at Rambara, all the way to the base camp, where it flattens. The last 1 km or so is an easy walk to the temple. You do not need a guide. Horses, Mules, Palanquins, and Porters are available at Gaurikund. It’s better to book them at Gaurikund itself; you will find many at several points on trek too but they will ask for a price higher than the altitude you will be standing at. Medical and First Aid facilities are available at several places including Lancholi and Base Camp. There even is a small government hospital just 200 metres from the temple. And police check posts on several points. Queue outside Kedarnath Temple in the month of May. There are many Lodges, Ashrams, Guest Houses, and Camps running from Gaurikund to Base Camp that provide cheap accommodation, both private and government run, including GMVN Lodges at Lancholi and Base Camp. The prices can vary from INR 500 per room to INR 2000, depending on the rush of pilgrims. While the rates shoot up in May-June (peak season), they also go drastically low in the months of September-October (the best time to do this trek). However, don’t expect anything in terms of luxury; expect basic rooms, warm quilts, simple but good food. There are plenty of tea/coffee shops on the way that also offer food. Expect to pay around INR 100 for a hearty meal for one person. Queue outside the Temple in the month of May. Yes. It depends on your fitness. We had set out at around 2 am and were back by 5 pm the same day, from Gaurikund to Kedarnath and back. Approximately 35 kilometres in 15 hours, which includes 4 hours of wait in the queue outside the temple (it was May). I’ve been told time and again this is a small feat. I am not proud of it. We were behind schedule and had to make up for it. I don’t like to test my speed against distance. Time to me is mostly irrelevant. I like to walk easy. Sit in silence. Maybe lie down. Take a gander at the grandeur. Look into the soul of these mountains. Feel a beat or two. Click a few pictures. Start again. Repeat again. Must we tie self-made accomplishments to places such as these? This is the gist of it. If you have any further queries, feel free to leave a comment below or contact me through Facebook or Instagram. I’ll get back to you as soon as I can. Stay safe, travel responsibly! Peak to my right, temple to my left. Guess which one I love more. Very crisp and adequately informative. Hey Bro, Thanks for this description..! !